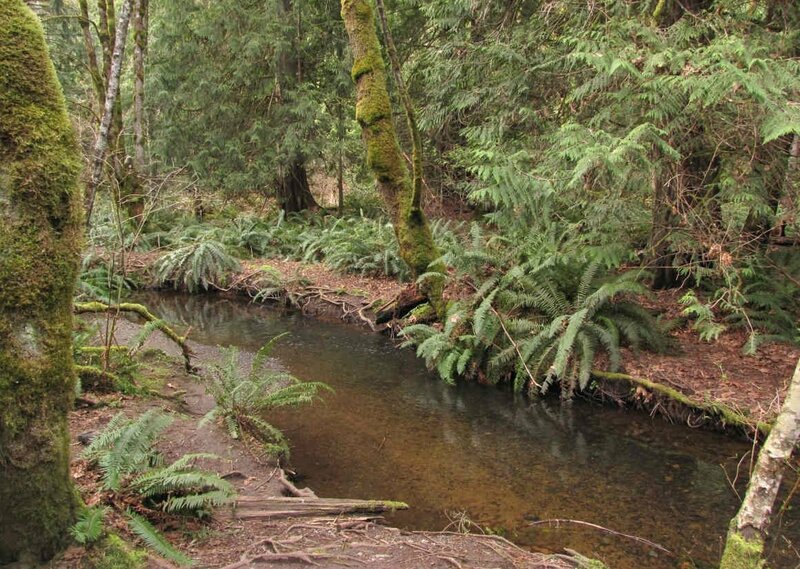 The Linley Valley is a 145-acre greenspace in north Nanaimo, a network of misty trails with a calm beauty. It is very lush and full of deer, with some ponds and creeks, and wooden bridges. The main trails here are well-marked and well maintained, so this is a great place for visitors with mobility issues. But if you make your way to the higher spaces, you'll be rewarded with some nice views over Departure Bay to Newcastle Island and downtown, or to Mt Benson, or to the Salish Sea. The Linley Valley was slated for residential development but was saved in 2003 by the people and government of the City, and by a campaign spearheaded by the Nanaimo Area Land Trust (NALT). Good thing, too. This is a large greenspace that is incredibly valuable for the people of Nanaimo. There are lots of ways into this system, but this is one of the only ones I've used, which has a proper parking area.